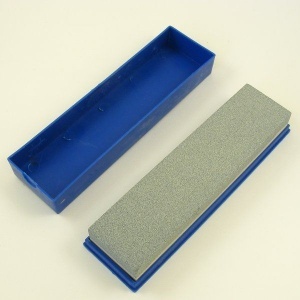 This silicone carbide sharpening stone is double sided, with one fine and one medium grade surface. It measures 200 x 50mm x 25mm deep, and comes in a two piece plastic storage box. This stone can be used with either oil or water, though we always prefer to use a sharpening stone with oil, as it gives steel blades an extra level of protection against rust. 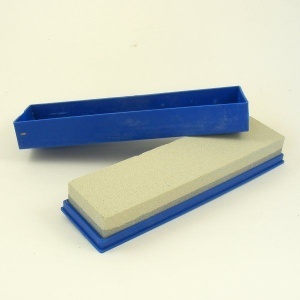 * Please note that a sharpening stone only gives a first level of sharpening and for leather knives we recommend that you fine tune your blade using a strop and either valve grinding paste or jewellers rouge after sharpening on a stone.